Chris Thorman, a blogger for Software Advice, recently wrote about a very cool environmental monitoring system developed by Sharman and Knowledge Global, a sustainability consultancy. 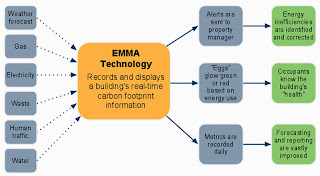 Their Environmental Management and Measurement Application (EMMA) records and diplays real time carbon footprint information, and sends real-time alerts to property managers, is tied to "eggs" that glow green or red based on energy use and records daily metrics. This system engages occupants as well as building managers. The occupant engagement component is particularly critical for ongoing energy reduction as we know from recent behavioral studies. The EMMA monitor in the lobby of buildings displays energy use by floor, room and even by tenant. 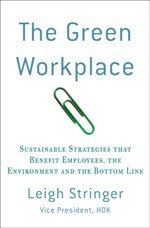 This makes it easy to organize competitions that motivate tenants to reduce the amount of energy they are using. EMMA’s wireless “eggs” are another visual incentive for reducing tenants’ carbon footprint. These egg-shaped devices sit throughout a building – in common areas and on each floor, for example – and glow red or green as energy use fluctuates against the optimal forecast. This constant reminder about energy use encourages tenants to use less, or at least, makes them aware of energy use in areas they may have not even thought about before. "An Energy Management System that Integrates Human Behavior".......Great post..
Juicy Couture makes certain it's its title Juicy Couture in most groups also it promises its clients using the better if there's. Being part of the JC fan following could be very good for a person as you become to become trendy whatsoever occasions.